Have you ever dreamed of living in a treehouse like the Swiss Family Robinson? Or what about swinging from tree to tree like Tarzan and Jane? Either way, The Gibbon Experience in Northern Laos is a childhood dream come true. Complete with intricately built tree houses perched atop some of the highest trees in the Nam Kan National Forest, The Gibbon Experience has some of the longest and tallest zip-lines in the world. 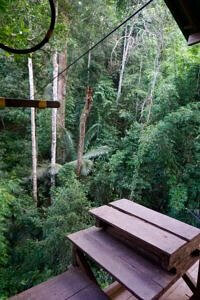 The Gibbon Experience is not just any other zip-line tour. 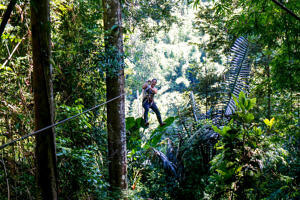 With free rein to explore the jungle and zip-line until your heart's content, you are sure to leave in monkey bliss. 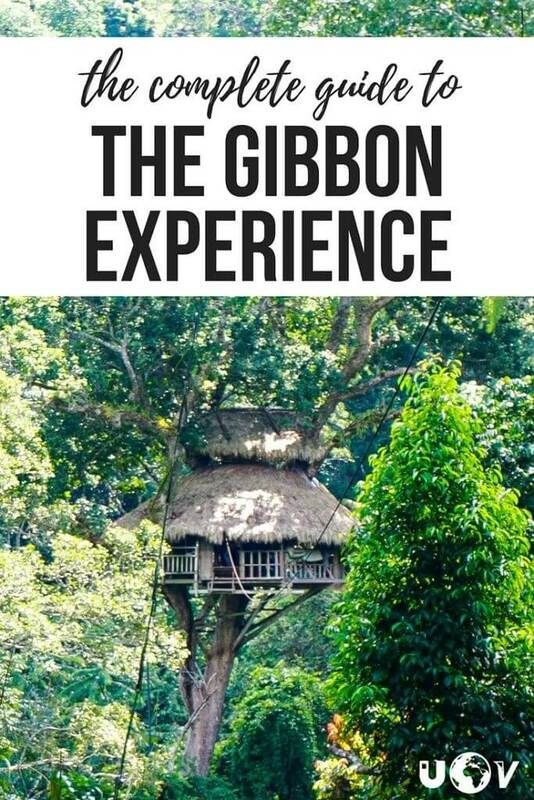 Check out our other post - Living In Tree Houses On The Gibbon Experience to read about my experience getting over my fear of heights and some severe vertigo brought on by living in a tree house for three days. 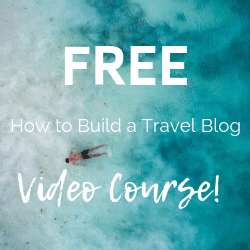 This post will give you more in-depth information about the Gibbon Experience including when you should go, the cost, what you should pack, and more. What is the Gibbon Experience? The Gibbon Experience is a conservation project that was started in 1996 in the Bokeo Providence of northern Laos. 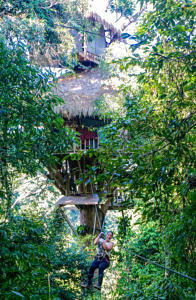 Over the last 20+ years, the Gibbon Experience has constructed more than seven treehouses and twenty or so zip-lines. The Gibbon Experience’s mission is to protect the forest of the Bokeo Providence, which was quickly being destroyed by illegal logging, commercial farming, and excessive slash and burn practices. Before the Gibbon Experience was founded, the only way locals could make money to survive was through these unsustainable practices. 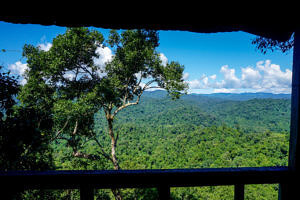 The Gibbon Experience has provided over 120 jobs to locals and has managed to restore the forest to its’ natural state. 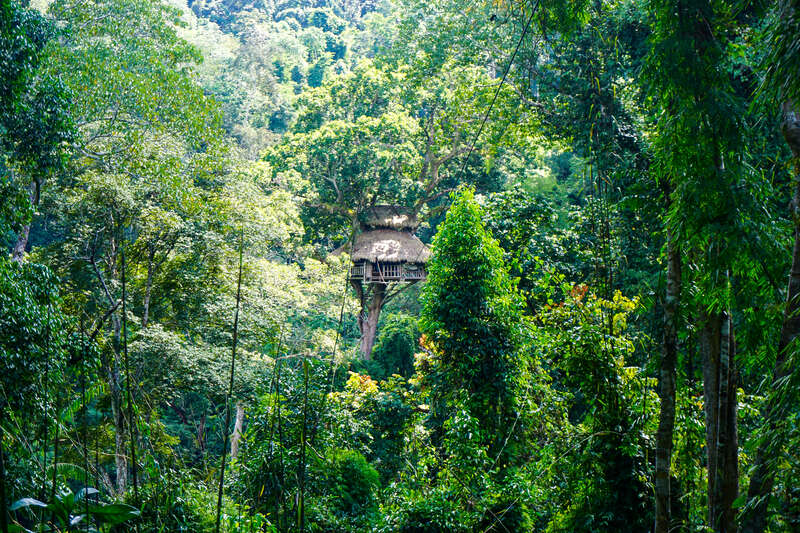 Through projects like reforestation, sustainable agriculture, and forest patrols, the Gibbon Experience protects the Nam Kan National Forest from poachers, deforestation, and harmful hunting techniques. 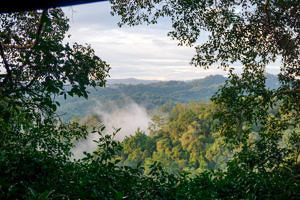 Ecosystems like Nam Kan Forest can be incredibly difficult to see without causing them harm, but The Gibbon Experience offers visitors a unique perspective while doing minimal damage to the natural environment. The Classic is described as the easiest trek (but be warned! You will still trek a lot) The first day is spent checking in, learning the ropes, and getting to the Nam Kan National Park. You will have some free time later on in the day to do a little zip-lining. The second day you trek to all of the other tree houses within The Classic route. The third day includes some more zip-lining at the intersection tree (check out Living In Tree Houses On The Gibbon Experience for more about my terrors with that) trekking to get back to the village and then finally the long ride back to Huay Xia. If you choose The Waterfall tour you should be in good shape because you will be doing more trekking than The Classic. You will trek along the Nam Nga river, with the option to take a dip in a swimming hole with a waterfall. 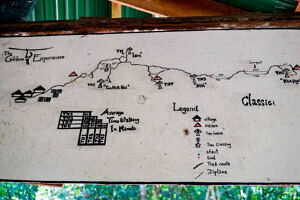 This tour takes you deeper into the steep hills of the Nam Kan Forest. There are two tree houses on this tour so there will probably be another group out there with you. The first tree house is nestled next to the Nam Nga River, while the other has a grand view overlooking the Nam Kan Forest. You will swap tree houses the second night so you can experience both. 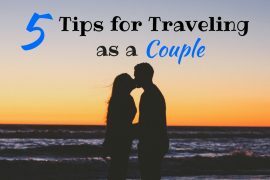 The express tour is a shorter tour designed to give you more zip-lining and less hiking, but the tradeoff is that the chance of spotting any wildlife is greatly reduced. Just the same, the view from the tree house on The Express tour is incredible so that’s a plus. If you’re short on time the express tour is your best option, although I would highly recommend doing The Classic to really get a feel for the whole experience. I felt the experience was worth every bit of the high price. The Gibbon Experience is rather expensive especially considering you won’t be receiving 5-star accommodations or food. BUT all of the profits are used to benefit the conversation projects The Gibbon Experience founded. Between those projects and the jobs brought to the locals, you can rest assured that the money you pay is funneled straight back into the local communities. You will need to carry whatever you bring, so I would recommend packing light. To have an enjoyable time on the Gibbon Experience I would recommend going sometime between October and April- which is the dry season in Laos. I have heard and read horror stories of attempting to trek in the jungle during the rainy season. Unless you’re searching for a particularly wet and muddy adventure, I would not recommend trying to go during the rainy season. How Do I Get to the Gibbon Experience? The main office of The Gibbon Experience is located in Huay Xia. Which is a small town in northern Laos on the banks of the Mekong river. 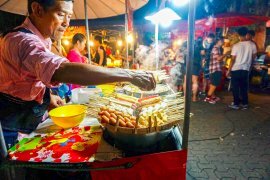 Huay Xia itself is a short ride from the Laos-Thailand Friendship Bridge border crossing, and many people opt to come from Chiang Rai in Thailand. If you are already in Laos you can come from Luang Prabang by taking the slow boat up the Mekong river. However, you should allow a few days for this unless you want to be tossed around on one of the “fast boats”. Laos is an amazing country and are so many other awesome things to do there. Make sure you take some time to explore the rest of the country as well. 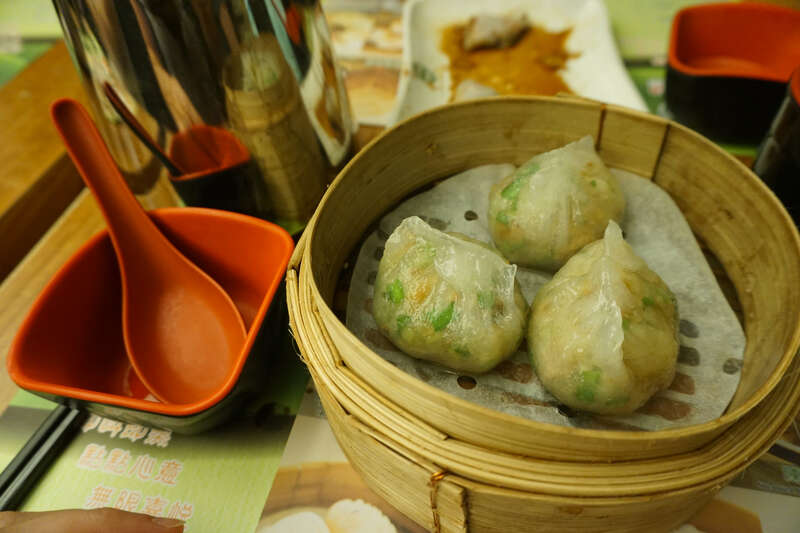 Here are some examples of the meals we were provided. But of course, this could vary depending on the time of the year or what is available at that time. Recently the Gibbon Experience had a tragic accident resulting in the death of a fellow traveler. An accident report was issued and can be found here accident report. Unfortunately, it seems as though it was a freak accident. The Gibbon Experience released an additional statement saying they are trying their very best to make sure their zip-lines are up to par and as safe as possible. There are definitely parts of The Gibbon Experience where I felt unsafe. But I think that was mostly due to my fear of heights and the vertigo I experienced. You are responsible for your own safety over the course of the two or three days. Pay close attention to the safety video and when your guides first show you how to clip on to the line. Don’t mess around and don’t save breaking for the last second. I often hit the brakes too soon and had to swing around and pull myself the rest of the way. Better that than bashing into the tree at the end of the zip-line. Other than that you are on your own to have a blast! Remember to be safe and don’t forget to tip your guides! Have you been on the Gibbon Experience? Are you planning on going and we didn't answer a question you have? Please let us know below!